It’s easy to walk around most days not thinking about the fact that the ground beneath our feet is constantly drifting along at a rate of a few centimeters per year, pushed and pulled in different directions by currents in the earth’s mantle. Once in a while, however, the ground starts shaking, and we’re reminded that the landscape is not as static as it seems, or as we expect it to be. With all of the recent seismic activity in Nepal, it seems timely to take a look at our own local fault lines. Nepal is located along the border of two converging tectonic plates, where the Indian plate is slowly diving under the Eurasian plate, pushing up the Himalayas and causing earthquakes as pressure builds and releases. Sometimes the earth’s tectonic plates move slowly along, releasing pressure little-by-little in small earthquakes; sometimes pressure builds for a while, until a plate moves in one big jump. According to an article in the Wall Street Journal, the first earthquake that happened in Nepal a few weeks ago resulted in a jump of 6.5 feet. Aftershocks have followed; the geologic clock ticks on. Over in California and Nevada, we live relatively close to a plate boundary, too. The Truckee River and almost all of North America are located on the North American Plate, shown on the map below in brown. Part of California and the entire Baja Peninsula sit on the Pacific Plate (shown in yellow), which is slowly moving to the northwest along a transform plate boundary, the San Andreas fault. Along that fault line, earthquakes are common. 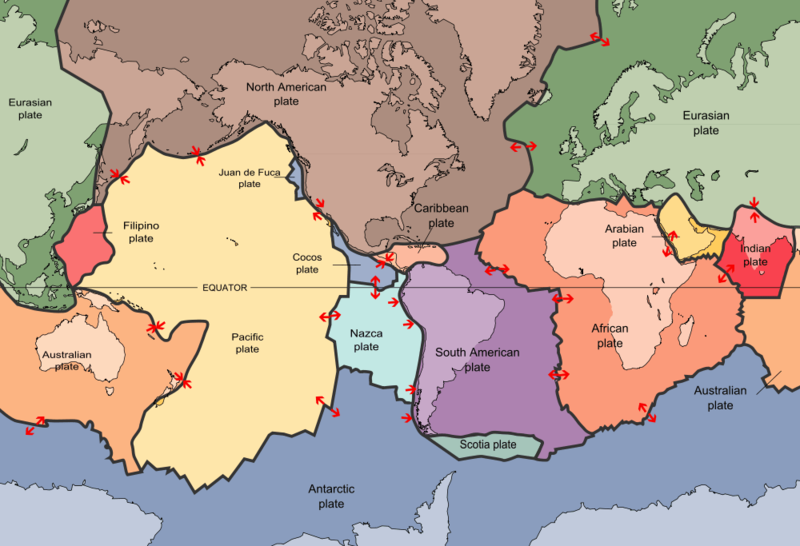 Map of tectonic plates. Public domain image from USGS/Wikimedia Commons. Why, then, do we sometimes get small earthquakes around Reno, which is pretty far from the San Andreas fault line? Interesting fact: Only about 75% of the relative motion between those two plates occurs along the San Andreas Fault. 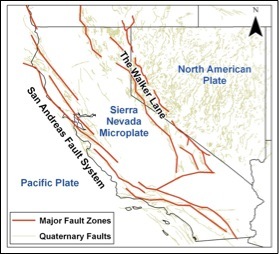 The other 20-25% of the motion occurs along a fault zone which passes right through our area, along the lower Truckee River. The Walker Lane passes through the Truckee River region of western Nevada. Between Wadsworth and Pyramid Lake, the Truckee River follows the path of an important zone of faults called the Walker Lane, which began to develop approximately 13 million years ago. The Walker Lane is not one single fault line, but a very complex grouping of smaller fault lines which run every which-way (some to the north, some to east, and so on), within an overall northwestern trending beltway of faults. Want more info on earthquakes? The Nevada Seismological Lab has a map of recent earthquakes on their website at http://www.seismo.unr.edu/Earthquake. You can follow them on twitter @NVearthquakes for earthquake updates as they happen (there are several every day).